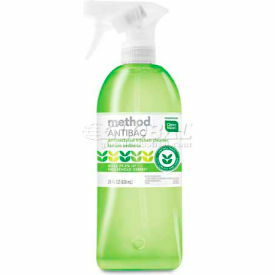 I have found the worst smell, and it is Method Antibac Kitchen Cleaner, Lemon Verbena scent. I don't know what this stuff smells like, but it ain't lemon verbena. There is something so awful about an odor that is supposed to smell clean, but in fact smells foul and putrid. And it lingers on and on--I used it once to attempt to clean my oven (was unsuccessful), and the smell stayed in our house for a month. I have held onto it out of guilt, but this morning I used it to clean the toilet, which I realize is in direct violation of the product's stated purpose as a kitchen cleaner, but it also says antibac, so . . . Anyway, I can't bear it any longer. The whole house smells rancid and sour now, after just a few little squirts onto the toilet. To the dump with it! Product may not stay. There was something so delightful about reading the words "ant poison." Ant poison! And that it was your mascara. Maybe the ant poison smell is to mask an even worse underlying smell?